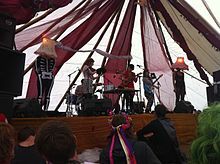 Landshapes is a British band known primarily for their effects-heavy psychedelic alternative rock. They released their debut full-length album Rambutan on indie record label Bella Union in 2013 and their second, Heyoon, in May 2015. The band consists of Dan Blackett, Jemma Freeman, Heloise Tunstall-Behrens and Luisa Gerstein. They were previously called Lulu and the Lampshades. Band members Heloise Tunstall-Behrens and Luisa Gerstein are known for their revival of the 1931 Carter Family song "When I'm Gone" as "Cups". ^ "Cups, You're Gonna Miss Me: Evolution of a Song". This page was last edited on 23 February 2018, at 09:51 (UTC).